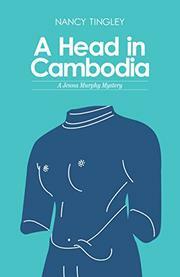 An unlikely California curator investigating Cambodian art forgery stumbles onto murder. Jenna Murphy is the curator of Asian art at Marin’s Searles Museum. With her purple hair and miniskirts, she’s younger and sexier than anyone expects a curator to be. P.P. Bhattacharya, a collector and major donor to the museum, brings her an exquisite stone head depicting Radha, lover of the god Krishna. It might be the missing sculpture stolen from a Cambodian museum a few years ago, or it might just be a superb copy. Improbably enough, P.P. found the head at a yard sale—and not just any yard sale, but the estate sale of a fellow collector who was brutally decapitated. To uncover the head’s true provenance, Jenna finds herself leading a tour of the temples of Cambodia with a motley crew of the museum’s most dedicated patrons, including P.P., a young techie with an anger problem, and his glamorous wife, Jenna’s troublesome boss, and some feisty senior citizens. As P.P. leads Jenna to art dealers and sculptors who might know whether the head is a treasure or a fake, Jenna’s budding romance with a handsome doctor is set against detailed descriptions of Cambodia’s cities and ancient temples. There’ll be threats against Jenna’s life and more murders before long-awaited justice is served. Tingley’s debut is more travelogue than mystery, with some crucial plot points left unexplained—a pleasant diversion for a plane ride to the reader’s own adventure.